Attending the Golden Puck Awards in Slovakia, newly-minted Chicago Blackhawk, Marian Hossa, was in attendance to receive the award for best forward. 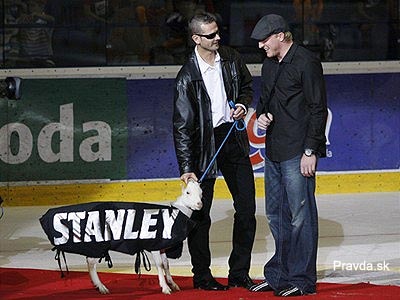 Along with his trophy, Hossa — who left the Pittsburgh Penguins after last year’s Stanley Cup loss to try and win one with Detroit instead (this year’s losers to the Penguins) — was given a goat named Stanley as a joke on his poor decision-making. Since the Slovokian word for goat is “cap”, he won the Stanley Cap! Finally! « To the Windows! To the WALL!